Split surface crank terminal table for CAD applications. Keyboard surface is split where 15.75" remains on a horizontal plane while the balance can be tilted up, creating a perfect platform for writing, digitizing and drafting. Crank and tilt handles are placed on the horizontal keyboard surface for seated adjustment. A separate crank handle is also found on the VDT surface for independent height control. Annual spindle lubrication is required. 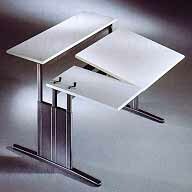 Note: Only the table height adjustability can be motorized. This table should be used as a standalone. If you desire to add it to a workstation configuration, a 30" deep table will align with a 1" overhang to the keyboard/tilt surface (29" deep). Keyboard Height Range 25"-39" 25"-39"